Overall, the View at Montgomery has been a good place to live due to the location since it is close to the Temple University Tech Center and my classes. Everyone is very welcome and respectful. It is great to live in The view at montgomery. I’m close to all my classes and It is very convinient. The apartment is confortoble, new, and beautiful. I love the community here at The View. The staff/employees are incredibly friendly and always greet me with a smile! The amenities are excellent, with a great 24 hr gym and beautiful sky lounge not to mention 4 fast elevators that ALWAYS are working (huge plus). My friends who live off campus love coming to my apartment to hang out because the View is such a great space. The view is a great place to live. Its the best location on campus and the security makes me feel super safe. The only thing that bothers me is usually the free printing isn't available because there is no paper or its broken and i don't always have time to ask someone to fix it. Aside from the inconsistently cleaned laundry and trash rooms, and hallways smelling of marijuana multiple times a week its a decent place to live based on location and amenities. I had specifically asked to NOT be roomed with a person, but she was still put in our room because she added me as a requested roommate. In addition, the roommate that I had requested and I were suppose to share a bathroom. Instead, the roommate I asked to be kept away from shares a bathroom with her. I think I was given the wrong key during move-in because I have been asked several times now if I switched rooms (as if I preferred to get the smaller room away from the roommate I actually requested to be with). The disorganization is not worth the rent. I always discourage my friends from the View and Vantage. The only perks about living here are the frequent community activities and the other residents. The location is great for getting to classes quick. The building is always clean and they make sure to organize events for buildings residents. I love the community feel the View at Montgomery encourages. Regular events are lots of fun, and free food is always a bonus! Thanks for a great living experience. Thanks Anna- we could NOT agree anymore! Building a sense of community is of the utmost importance and we're happy to hear you're enjoying our events =) Let us know if you have any suggestions- its been our pleasure! love the view community! they offer great amenities and all of the staff is so helpful and understanding.. overall i have had great experience! I have had a good experience, the place is always clean and well maintained. The staff who work there are very nice and helpful as well! Best decision ive made in college! The View at Montgomery is a great apartment building at Temple University with a variety of amenities that are available for all residents to access. Few things make us happier than satisfied residents! 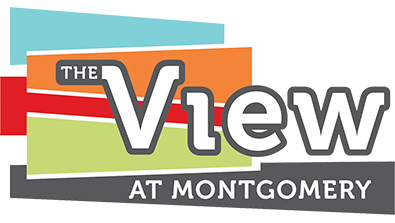 We are so pleased that you enjoy calling The View at Montgomery your home! Please let us know if there is anything you need to continue to love your home! This is a great apartment to live in. Security is very nice and sweet, and they do their job very well, as does the front office. The gym is well equipped and always clean. I love to study on the 14th floor because the view is very nice and the room is usually quiet! Thank you Rhea! We always encourage feedback from our residents and your feedback is especially nice- we appreciate it! The location is great. The maintenance and security staff are so nice! The office isn’t always helpful though, however this year there are definitely more knowledgeable people working there. Hey Christina! Do you mind emailing us at csoop@achliving.com and letting us know how we could improve our customer service? We're always looking to use resident feedback to improve. Thank you! Has been good! There have been several issues within the apartment maintence wise and management is well aware and has yet to resolve them. For example, a mold issue under my sink that needs replacement of the wood board. The maintence people have helped me as much as they can but it’s upper management that needs to coordinate this repair. I find this really frustrating as I have let them know multiple times and I have a serious mold allergy but nothing is done about it. Otherwise, things are great. Hey Megan! That was not mold- just water damage from a leak prior in the year. The board should have been fixed since- can you please confirm by emailing management? We attempted contacting you but did not get a response. Thanks! I have not get started living here but I have already signed my lease for next year. Looking forward to finally having a kitchen and private living space! The apartment is nice and has everything you need, but if you have a problem it’s hard to get help from the staff. The events are nice and often. I am an international student and living at The View has made me feel like a part of a community. The people that work there are so kind and welcoming and I've enjoyed getting to know the American culture through all the fun activities that happen throughout the year!!! Hey there thanks so much for taking the time to write us such an incredible review! We are so happy you've enjoyed our events and activities- we're happy to have you as a part of our community =) Let us know if you have any ideas for future events! Maintenance is great in general. However, I think laundry room needs more attention. A washing machine on my floor was out of order in the whole last semester. The view has been great so far. Friendly staff, clean living areas, and many great amenities. It’s a bit pricey but the location on campus is worth it. Hey Michael, thanks for the review! We love being so close to campus as well as everything else you mentioned. We hope you continue to enjoy your experience here! Living at the View has been great! The staff is very friendly and helpful and the amenities are nice. The only thing I would like to be different is the laundry. Having more washers and dryers on each floor would be great. Hey Hannah! Thanks for providing feedback- it is SO valuable to us as we are constantly trying to improve the experience we offer. We will definitely look into your suggestion! the voew is very nice and at times provides social events to engage residents. although safety is always an issue and can go wrong at any time, the view security does a great job at ensuring safety.